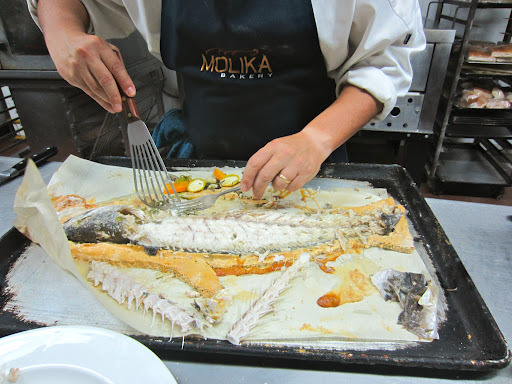 Cooking Class at Molika: Pesce in crosta di sale | ¡VidaMaz! I’m privileged to have a terrific group of lady friends who like to cook, and we get together to learn and to teach one another once a month or so. 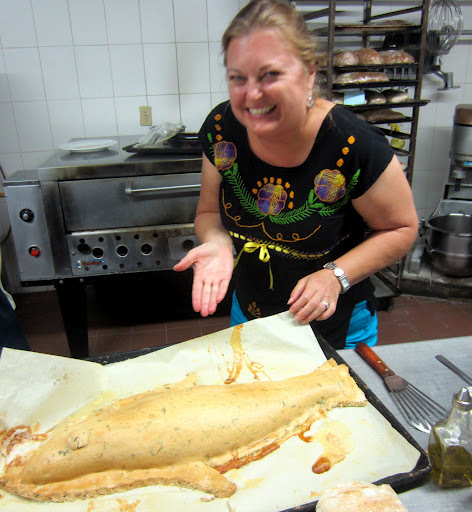 In addition to our Thai cooking classes, we’ve made timballo (Italian “drum” with pasta and eggplant), tortas ahogadas, rajas, chicken mole, macarones, and lemon cake, among some other wonderful things. Well, my friend Magda got the wonderful idea to book us a series of classes with Héctor at Molika, downtown on Belisario Dominguez near the Plazuela. While I’ve known Héctor for several years — he’s a GREAT bread baker (sourdough and ciabatta plus other good loaves) and I am in love with his grilled vegetables (which we also frequently make at home) — I discovered that he also truly shines as a teacher! He is funny, charismatic, and I LOVE that he teaches METHODS rather than recipes! In one two-hour class on cooking fish, he demonstrated SIX different methods of preparing the fish we commonly have available here in Mazatlán. For me who learned to cook fish while living in Japan, I learned a lot. 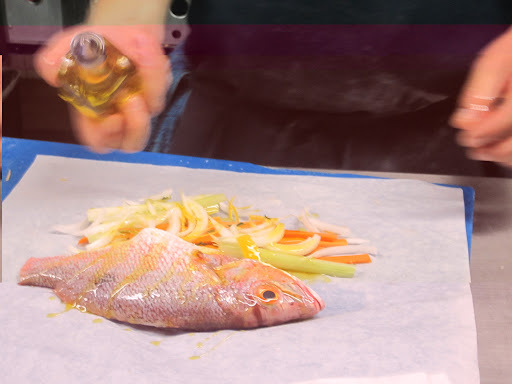 For example, he taught us to cut off the fins (see video above) before cooking the fish (you’ll know that most Asians LOVE the crispy fins and would never think of removing them before cooking), saying that the fins have too strong a flavor. My favorite? Well, by now you know me. I love something different, and especially something impressive. And Héctor delivered: Pesce in crosta di sale, or fish in a “tomb” of salt. I’ve eaten many fish baked in salt crust before, but nothing quite like this! 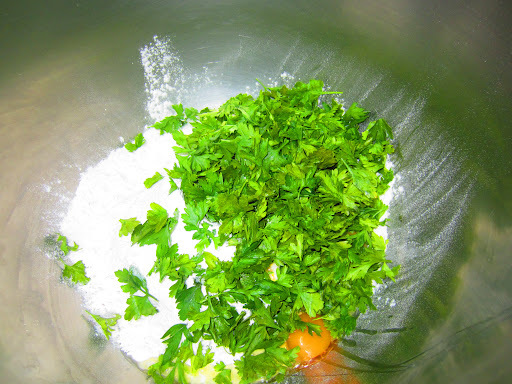 Rather than just salt with aromatics, Héctor made a salt dough with the 2 salt : 1 flour, eggs, fresh herbs and a bit of water. Trimmed it to shape (video above), and then baked it for 45 minutes. The fish of course turned out incredibly moist, aromatic and flavorful. 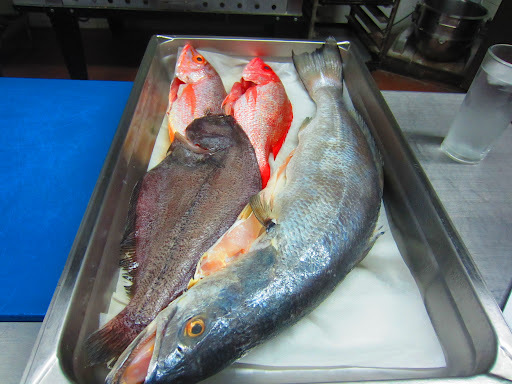 He said he prefers to use robalo rather than corvina, but I was plenty happy with this. 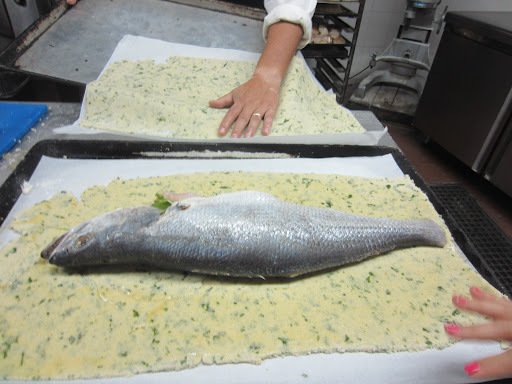 He suggested that we cut the rock-hard crust in the kitchen (you can see above that’s pretty challenging), then take the encrusted fish to the table, where we open it in front of our guests. That way the room fills with the wonderfully aromatic scents. Finally, unlike Japan where everyone knows how to eat fish on the bone, Héctor suggested we remove the flesh from the fish in front of our guests, serving it up on plates. 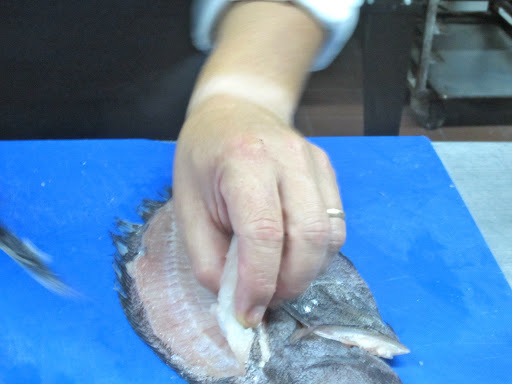 He removed and discarded the skin, saying that baked/steamed fish skin doesn’t taste good. I can hear the shocked gasps of my Asian friends now, but it was nice for me to learn a more European approach. I will definitely give this gorgeous dish a try. I must admit that I preferred the taste of several of the other dishes he prepared! This one was just a presentational stunner, like my timballo (thanks, Allison, for teaching me!). 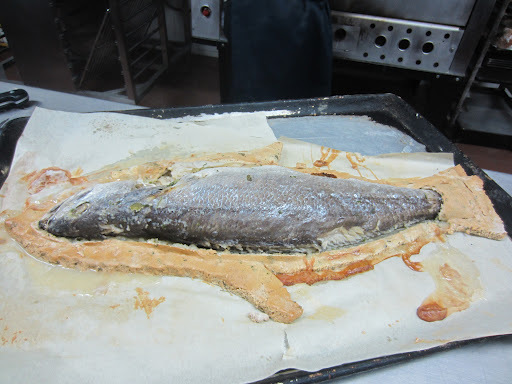 We made pescado en papillote, fish steamed in paper. We stuffed the fish with aromatics: lemon peel, garlic and fresh herbs (basil, parsley, rosemary, thyme), then garnished with sliced fresh celery, onion and carrot. It was interesting to me, again with my Asian influence, that Héctor taught us to peel the celery, removing the fibers. Definitely a finer dining touch than I’m used to. Above you can see Héctor opening the papillón. A third dish we made in this two-hour class was the dish I swore every single Japanese restaurant serves: sole meuniere (lenguado). 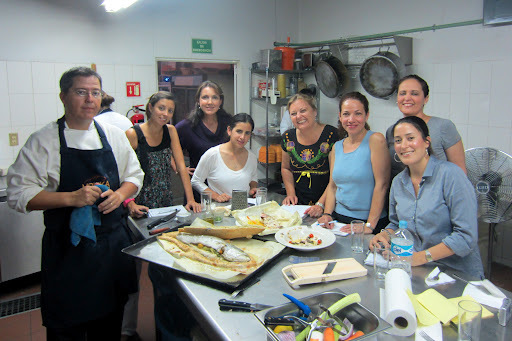 Many of the ladies were very happy to have Héctor teach them how to filet. Cleaning and preparing fish is fortunately one of the many skills I learned well in Japan. 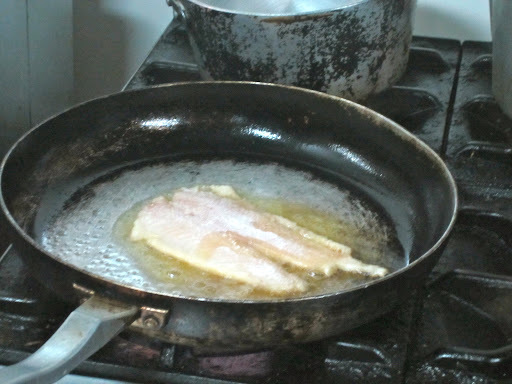 One of the key points he pointed out is to filet fish when it’s cold, fresh from the icebox. That way it’s much firmer and easier to handle. Héctor studied and cooked in London before returning to his native Mazatlán, and he uses lots of olive oil and sea salt, as you’ve already seen (way more than I’m used to, though I will start putting a bit more olive oil on for taste at the end), and for this dish he used a whole lot of butter as well. Nobody said good cooking isn’t fattening! He did caution us to check the ingredients on the butter we buy, as ideally it should be made from milk, and not contain emulifiers and a bunch of chemicals. I do think that’s part of the baking challenge I’ve had since I moved here — gotta buy better butter. 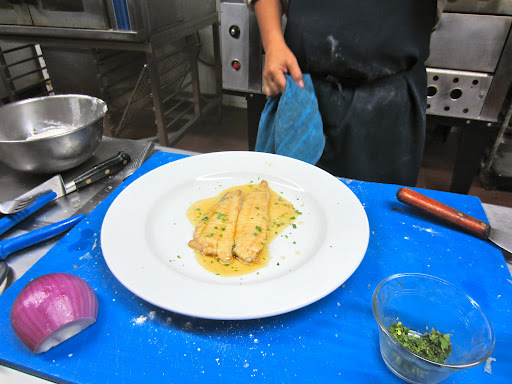 And here we have the finished lenguado/sole, covered with sauce from the pan and garnished with a bit of parsley. I had been craving salmon and asparagus, and just that morning bought both to make for lunch, so was fascinated to see Héctor make this as part of our repertoire for the day. 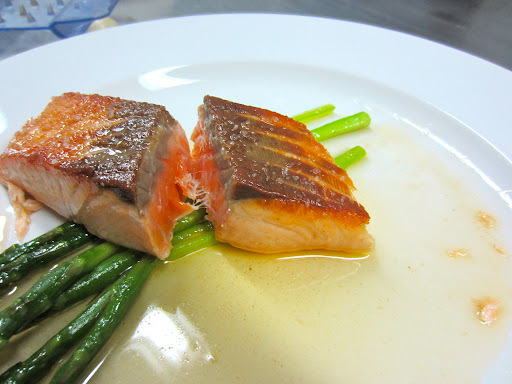 He of course used clarified butter as it withstands higher heat, to get the nice crispiness on the salmon. Note: he removed the skin before cooking. I guess this is also either a European way or alta cocina, because personally I love the crispy skin. I was sooooo gratified to see him cook it the way I feel it should be. Héctor told us that salmon, tuna and swordfish should always be left rare in the center, and I heartily agree. People here in Mazatlán always seem to overcook fish. 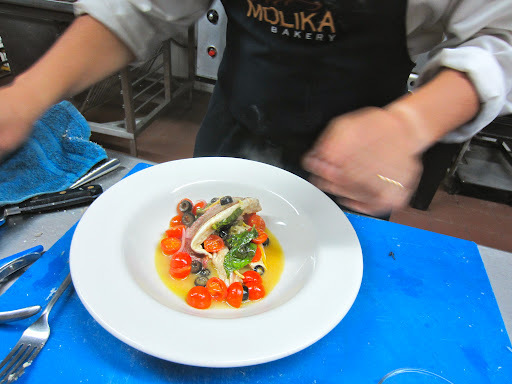 The fifth dish he made was swordfish. 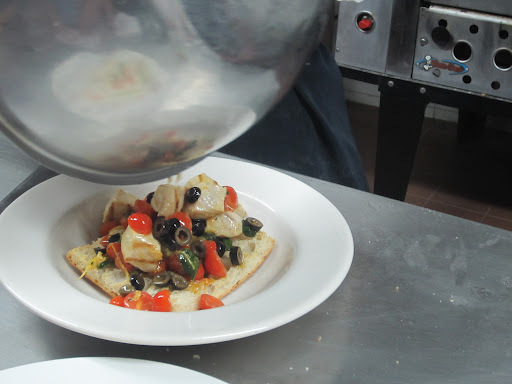 He cubed the fish, sauteed it with fresh herbs, cherry tomatoes, capers and olives. In addition to the lemon (yellow lemon) rind he added to most all these dishes, he also added a bit of lemon pulp. This concoction he poured over his famously to-die-for ciabatta, and oh my!!!! The bread somehow soaked up and enhanced the lemon flavor of the sauce, and it was soooooo delicious! I’ve left my favorite dish for last. 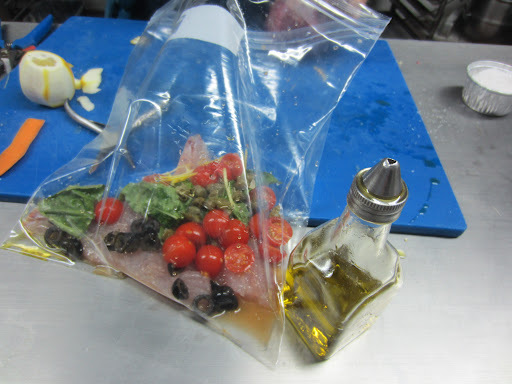 Fortunately, it was also probably the easiest to cook: pescado en la bolsa, fish in a bag. He used the same ingredients as most of the other dishes — fresh herbs, cherry tomatoes, olives, capers, sea salt, extra virgin olive oil. The wonderful part, besides the incredible taste? He put all the ingredients in a ziploc bag and cooked it in near-boiling water on the stove! It took just a few minutes and there was nothing except the serving dish to clean up! My son is in Scouts, and they cook just like this on their campouts. Maybe not quite the gourmet ingredients as this, but still very tasty nonetheless. Thank you, Magda, for setting this up for us! Thank you, Héctor, for a marvelous class! We are very much looking forward to our next one. Anyone wanting to arrange a class for a group of friends, please give Molika a call: 669-981-1577. 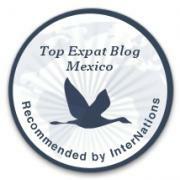 Héctor’s English and Spanish are flawless, and his kitchen skills are a gift to Mazatlán. 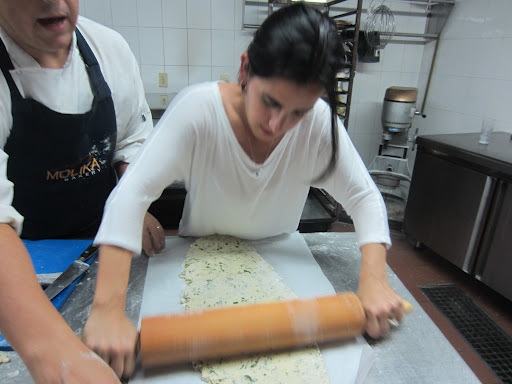 I am in Mazatlan until March 25th and I would love to take a cooking class. I am especially interested in preparing fish dishes. I have a reservation for dinner at Hector’s tomorrow. Please let me know if there are any cloasses available. Dear Joan, you should talk to Hector about it when you are in the restaurant. I have taken a couple of his classes but I have no role in coordinating them. Enjoy! I really liked the fish one. I believe Alistair at Water’s Edge also does cooking classes, so talk to him as well. Wonderful man.